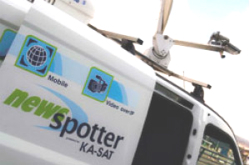 Eutelsat NewsSpotter: Ka-band IP satellite services. Dublin, June 2015: RTÉ, Ireland's national public service broadcaster has signed a two-year agreement with Europasat to use the innovative NewsSpotter newsgathering service provided by Eutelsat Broadband. RTÉ will use NewsSpotter for live satellite transmissions of news and recorded video and audio content from areas with limited or no access to high-speed terrestrial broadband. The NewsSpotter service, provided via Eutelsat's KA-SAT satellite, has transformed the ease and economics of satellite newsgathering. The latest generation of lightweight equipment, with guaranteed bandwidth up to 10 Mbps, supports transmissions of live video and audio in SD and HD. As a completely IP-based service it is adapted for quickly sending store-and-forward files and FTP. NewsSpotter can be used in combination with IP codecs, such as, M-Link Live-X or M-Link News Caster for video and audio. RTÉ will be using three NewsSpotter systems with autopointing antenna for live news inserts. Content will be routed directly from Eutelsat's Turin teleport to London Telehouse North, where it will be handed off to the RTE network. Europasat's broadcast specialist partner, Auriga Networks, will manage this operation. Using the firm's dedicated fibre cross-connect between the two hubs, IP content can be transferred quickly, reliably and efficiently from the field to the broadcaster or internationally, via BT Tower. Piotr Kaszynski, Technology Manager, at RTÉ News and Current Affairs said: "The NewsSpotter service allows our teams to become more effective in the field than ever before. This technology is transforming the ease and economy of delivering content. RTÉ News Ka SNG units are fully HD capable and provide the facility for multi-camera production. Availability of reliable high speed internet access via NewsSpotter enables future expansion of remote editing workflows directly to reporters working on stories in remote locations." In recent weeks RTÉ News has used the NewsSpotter service to provide coverage of the Prince Charles visit to Ireland, the Irish constitutional referendums and the UK General Election from Northern Ireland. Flexibility and mobility are at the heart of the NewsSpotter service. Bandwidth can be reserved on a pay-as-you-go basis through an online booking system. Users simply log in and enter their terminal number, location, time slot and the desired bandwidth. NewsSpotter satellite terminals are available as Flyaway models or Autopointing versions. Europasat manufacture their Flyaway Kits designed for operation in harsh environments. The drive-away, motorised terminal is available with dish sizes from 75 to 120 cm, small enough to be mounted to the roof of a car. "Ka-band satellite services are rapidly becoming a standard because of the dual benefits of dedicated uplink speeds of up to 10 Mbps and the low cost of equipment and service," said Selwyn Petterson, Director at Europasat. "Europasat is currently delivering services to more than 50 broadcasters, including large organisations such as the BBC, CNN and RTÉ, and many small production companies and freelancers. As satellite broadband becomes faster, it is being deployed by industry for remote broadband, and importantly as a failover system when terrestrial services are interrupted."